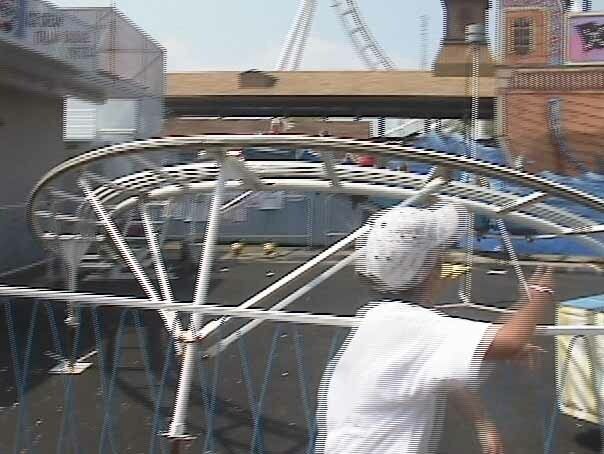 The Kiddie Coaster is a steel sit down roller coaster. (Junior). It is fast, fun, rerideable, it has a large capacity, and a long duration. I havent ridden it recently so I cant give it the best review, but from my sisters perspective it seems like a good ride. I hated it! My little sister liked it and made me ride it! An okay kiddie coaster but has no special qualities. This ride is one that appears to have no thought put into it either by Trimpers or the designer Herschell. This ride has absolutly no themeing and no special elements. At least this kinda neat looking cars. I can not remember if taller people are permitted on this ride. When I go to Trimpers Ammusments this summer I will check. My 3 year old son and 5 year-old daughter both liked this circle track kiddie coaster. It used to look undistinguished because it had virtually no themeing. However, now they have relocated a haunted boat and the kiddie bumper boats near it and it looks better. regular kiddie coaster with nothing special!